TERRE HAUTE, Ind. -- With original masks crafted by Indiana State University students and a dose of physical theater, three short classic plays will get a new lease on life on the Dreiser Hall Theater stage, creating an evening of magic, marvels, and farce. The evening, titled "Poison, Poets and Other Wonders," is the result of director Arthur Feinsod reading plays while on sabbatical last year. "I came across three plays and I wondered if they could be modernized and adapted for masks," he said. Feinsod, professor of theater, was planning on teaching an advance mask acting class this semester, due to another faculty member being on sabbatical. He began writing and had drafts of scripts by Christmas. "The writing went very quickly," he said. "I wanted to keep things loose so the actors could improvise." Through Andrew Todd, Feinsod's teaching assistant, the playwright learned the other skills and talents of his students, who are primarily juniors and seniors, and incorporated them into the production. "These roles were made for us," said junior Justin Renner, who plays Reynoldo in "Pageant of Wonders" and Feodoro in "Park Poets." "In my case, Arthur took the fact that I play mandolin and ran with it. Acting while playing a mandolin is difficult, especially in this physically demanding production. It takes twice the focus. It's a lot of fun, but it's also hard work." Two of the plays are comedies -- one is physical farce while the other is closer to satire. The last play, "Park Poets," is more poetic and delves into human emotion. In "Delectable Poison," two servants defy their master's orders, bringing havoc to all their lives; with "The Pageant of Wonders," a company of actors try to dupe a room full of high officials on the wedding day of the governor's son; and in the finale, "Park Poets," two poets -one very old and one young - have a fateful meeting in a city park at night, opening the way to mystery and romance. The production has been physically demanding. "I told students you haven't done a good job unless you're panting after the first two plays," Feinsod recalled. "The actors had bruises after each practice." The physical demands came as a surprise to the students. "I didn't think I could hurt so much," said senior Shelby Damron, who plays Brighella in "Delectable Poison" and a priest in "Pageant of Wonders." A key component to the evening's chemistry is the timing of lines and actions. "For the first two plays to work, everything has to be fast. If things slow down the energy sags," Todd, a senior theater major who plays multiple characters, said. "When the energy sags, the audience figures out the joke ahead of time and then it's not funny." Actors learned to developed lazzo, a verbal or physical comic shtick for their characters similar to those of Kramer on "Seinfeld" or movements used by silent actor Charlie Chaplin. Prior to the class, Renner had a glimpse into what he was getting into by attending a workshop at the American College Theater Festival. "I really got a good taste on what physical theater is like before class even started. I've realized this is what I like to do," he added. Renner, who wears glasses and teeth in one of the plays, is torn between two worlds. "It's like having a mask, but not having one. I have to find middle ground," he said. Mask acting introduced students to a unique, new experience. "You become someone else when you put on the mask," Lindsey Smith, a senior theater major who plays Governor Corpulencia in "Pageant of Wonders," said. "If you connect with the mask really well, it's like taking off your face. It takes a little while to get your sense of self back after. The goal is to connect so well that it feels like you don't have one on." Damron, who admitted it once took him 45 minutes to an hour to get back to his normal self, agrees. "There are some masks that when you put them on, they fit well and you melt," he said. "I have a mischievous streak, and my character Brighella drags that out. If you don't hold anything back it will take everything out of you." The entire production has taken a lot of time, but Feinsod is happy with how it all has come together. "I had more time to do it, so I could do it methodically," he said. "I did it right, a step at a time. We were able to build skills that built on other skills. That was rewarding." In addition to building a foundation for his students, the production brought him back to his roots of teaching acting as a graduate student. "Now I'm doing it with masks," he chuckled. Feinsod said preparing for "Poison, Poets and Other Wonders" is an excellent example of experiential learning. "Mask acting doesn't have a book, you just have to do it," he said. "There are challenges with every stage, with mask acting; you have to work viscerally, physically and impulsively." Students were required to keep a journal for the class to reflect on the experience. "They write in the journal everyday either about making masks, mask acting or both," Feinsod explained. Most all the students will say it's been a very rewarding and enjoyable experience. "I've become more confident in regular life and in other productions," said junior Constance Johnson, who plays characters in two of the plays. "It opens up an entirely different world and I'm freer." Senior Nick Earnest, who also plays multiple characters, admitted physical theater was different that what he was trained in, has found his niche. "I'd love to do this forever," he said. According to Feinsod, the production was a community effort -- Michael Jackson, lighting; Sherri McFadden, costumes; Linda Janosko, masks; and student Eli Van Sickel, who served as sound designer and dramaturg, assisting with the script, publicity and rehearsals. "Linda, Sherri, Michael and Eli created a common look and sound that ties the three plays together," he said, adding patrons will hear Spanish guitar music during the productions. "It just felt like the music to tie those worlds together," he concluded. Feinsod has a bit of advice for those attending the upcoming production. "Bring your imagination and your sense of humor," he said. "And be ready to experience magic." "The production will be a visual delight," he added. "Poison, Poets and Other Wonders" will be performed April 22-25 at 7:30 p.m. in Dreiser Theater. Tickets are $7 general admission and ISU students are admitted free with a valid student ID. For ticket information, please call (812) 237-3333 or visit www.indstate.edu/theatre. 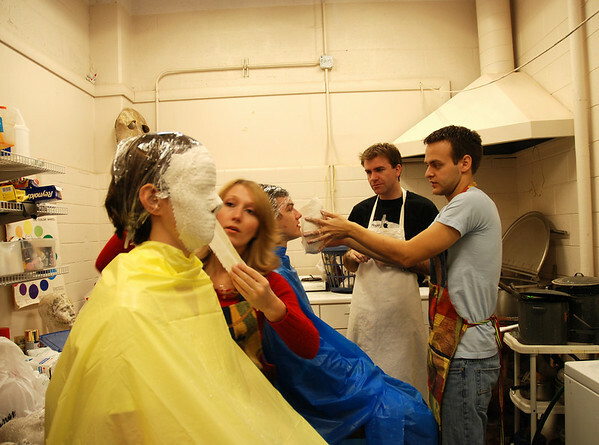 Top photo: Sarah Berg is seated while Tiffany Bula applies plaster bandages to the actor's face to make a negative face mold. When the bandages have hardened, they are removed. (In the background): Justin Renner is having the bandages removed by Andrew Todd and Nick Earnest. Middle photo: Senior Shelby Damron pauses from adding clay to his mask mold, imagining the possibilities. Bottom photo: Students participated in several in-class exercises to get used to acting with their whole body. With original masks crafted by Indiana State University students and a dose of physical theater, three short classic plays will get a new lease on life on the Dreiser Hall Theater stage, creating an evening of magic, marvels, and farce.